Replacing defective tissues is a promising but controversial possibility. Since the first isolation of human embryonic stem cells by James Thomson of the University of Wisconsin in 1998, labs all over the world have been exploring the possibility of using stem cells to restore damaged or lost tissue. Exciting results are now starting to come in. What is a stem cell? At the dawn of a human life, a sperm fertilizes an egg to create a single cell destined to become a child. As development commences, that cell begins to divide, producing after five or six days a small ball of a few hundred cells called a blastocyst. Described in Chapter 47, a blastocyst consists of a protective outer layer of cells enclosing an inner cell mass of embryonic stem cells. 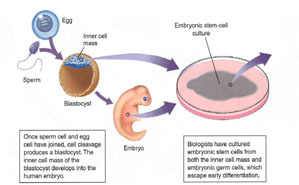 Each embryonic stem cell is capable by itself of developing into a healthy individual. In cattle breeding, for example, these cells are frequently separated by the breeder and used to produce multiple clones of valuable offspring. been syccessfully replaced with embryonic stem cells, as have the islet cells of the pancreas whose loss leads to juvenile diabetes. These very promising experiments in mice suggest that embryonic stem cell therapy may holds great promise in treating a wide variety of human illnesses involving damaged or lost tissues. This research is, however, quite controversial, as embryonic stem cells are typically isolated from discarded embryos of reproductive clinics, where in vitro fewrtilization procedures typically produce many more human embryos than can be successfully implanted in the propspective mothers womb. This raises serious ethical issues among some citizens who regard life as starting at fertilization. There is a second serious problem associated with using embryonic stem cells to replace defective or lost tissues. All the successful experiments described above were carried out in mice whose immune systems had been disabled. Had these mice possessed fully functional immune systems, they almost certainly would have rejected the implanted stem cells as foreign. For such stem cell therapy to work in humans, this problem is going to have to be addressed and solved. The need to solve this problem is the primary impetus behind the push to develop therapeutic cloning, described later in this chapter. Human embryonic stem cells offer the possibility of replacing damaged or lost human tissues, although the procedures are controversial. Using embryonic stem cells to restore damaged tissue. Embyronic stem cells can develop into any body tissue. Methods for growing the tissue and using it to repair damaged tissue in adults, such as the brain cells of multiple sclerosis patients, heart muscle, and spinal nerves, are being developed.